An icon is a visual representation of something. An icon can represent a person, place, object, idea, business, group of people, or other noun. Iconicity is the use of an icon to stand for something else. An icon can be a visual image such as a logo, or an icon can be a person who represents an idea or style. The form of an icon can suggest its meaning, and might simply be a shorter way of communicating something, such as a numerical representation of a written out number or a shorthand symbol. Iconicity, refers to the ability of a visual representation to signify what it stands for. Some examples of iconicity are below. "Nooooo!" The extra letters add length to the word, signifying that the word is stretched out when spoken. 1791 is a representation of the year Seventeen Hundred and Ninety-One. A picture of an apple is a representation of the Apple Corporation. "Chirp" is an onomatopoeia word, meaning that it is a word that represents the sound it describes - in this case, the sound a bird makes when it chirps. In American sign language, the word "you" is represented by pointing to the person being spoken to. The hand sign indicates the meaning of the word. In American sign language, signs relating to emotions, including angry, happy, and feel, are made on the chest, near the heart. In American sign language, signs relating to the way we think, such as understand, know, and think, are made on the head. A handshake represents an agreement made between two people or organizations. A bull stock market is represented by the Wall Street bull. The golden arches are a representation of the McDonald's fast food chain. The image of a mermaid with long wavy hair and wearing a crown is a representation of Starbucks coffee. Elvis Presley is an icon of the musical style of rock and roll. The red target symbol, circle, or dog with a target around its eye are visual representations of the retail store Target. A picture of a cup of coffee with steam rising from the top represents a hot cup of coffee, and is used in the logo for Dunkin Donuts. Another logo for Dunkin Donuts uses several visual representations for its slogan "America Runs on Dunkin." This sentence is communicated by showing a picture of the United States of America, a picture of a person running, the word on, and "DD" (stands for Dunkin Donuts). In writing, the three-dot ellipses symbol "…" can be used to represent a person pausing or trailing off when speaking. 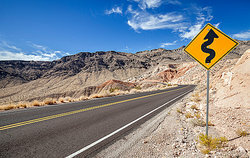 A road sign picturing a squiggly line represents the message that the road ahead is a winding one. A road sign showing an image of a deer or other animal communicates the message that those animals may be on the road. A sign outside of a restroom showing a picture of a man or a woman shows which restroom is for men and which one is for women. A person's initials symbolize the name of a person without writing out that name; JFK symbolizes the person of John Fitzgerald Kennedy. Some professions are represented by visual symbols, such as a staff with a snake curled around it symbolizes a doctor. Now you have lots of examples of iconicity. "Examples of Iconicity." YourDictionary, n.d. Web. 23 April 2019. <https://examples.yourdictionary.com/examples-of-iconicity.html>.